We live for racing, from the nervous excitement the night before raceday, to the thunder of hooves on the gallops on a crisp spring morning’s stable visit. From the exclusivity of meeting the trainer and jockey before the race to the champagne at the winners reception afterwards. From the thrill of a runner at York or Cheltenham, to the camaraderie of sharing a winner and unique memories to treasure forever. For the past twenty seven years, Niall has successfully run Racing Syndicates, accumulating well over three hundred winners as a racehorse owner. 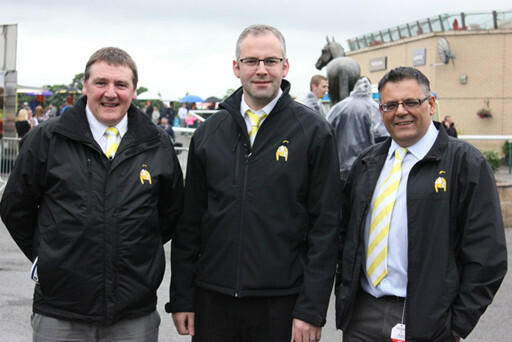 Niall is instrumental in keeping running costs competitive in order to provide OnToAWinner owners with the best training fees rates of the large syndicate organisations. Niall also has an exceptional eye for a horse. Along with Simon, Niall purchased Fast Shot who was rated 62 at the time, now rated 91 having been as high as 97 in 2014. Their success continued with the purchases of Toocoolforschool, a £16k purchase that won the Group 2 Mill Reef Stakes at Newbury and more recently Katies Diamond, who won impressively on debut and has since been sold to Qatar Racing a hugely exciting prospect for her new owners. Niall lives in North Yorkshire with his wife Sally and still has his old pal Quiet Times in his paddock! Simon has been involved in syndicates for the past 27 years, having over 250 winners in that time. Along with Niall, Simon has a huge talent for spotting true potential and value in a horse. He can list Quiet Reflection,Corinthia Knight, Katies Diamond and Toocoolforschool as horses purchased that have provided excellent value to their owners. Along with purchasing Group winners, Simon works tirelessly to introduce new people to Ontoawinner and does all the yearling buying with Niall. Simon lives in York with his wife Pam. Steve got the passion for horse racing back in the 70s whilst doing a bit of mucking out at Maurice Camacho stables in Towton during school holidays, howe haver he pursued a career in sales rather than horseracing. He has had shares in racehorses for the past 18 years. Steve looks after the Arc syndicate and Kublers yard. Steve is a fantastic character, who is absolutely key to owner experience and satisfaction. Chris has been an avid horse racing enthusiast since youth . He has been shrewd enough to have purchased shares in many winning horses over the years, Chris resides just outside Newcastle Upon Tyne with his partner Helen. Chris deals with all the owners in organising raceday badges and deals with many of the yards and future business scoping. As with his brother Niall,Ronan has had the racing bug since youth. He first caught the bug going to point to points around Ireland with his family. Involved with syndicates for the past 14 years , Ronan resides in Dublin with his wife Fiona. Ronan runs Ontoawinner Ireland and is our IT consultant and media expert. Jono grew up with horses in the south west, attending point to points and had a passion for horses growing up. 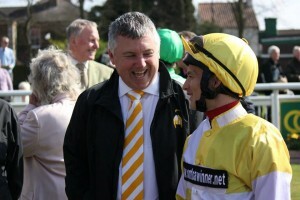 After working abroad for several years, he returned and became an owner with OntoaWinner before joining the management team. 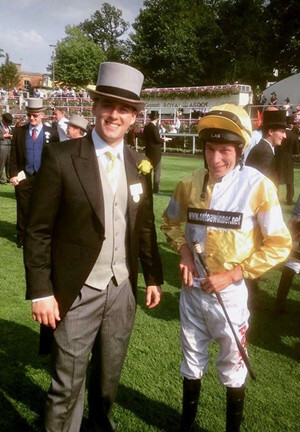 Jono is an invaluable member of the Ontoawinner team, he contributes to the day to day operations of the business as well as being a syndicate manager for multiple yards. 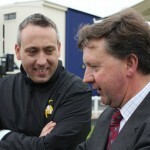 To buy a share in a racehorse with Ontoawinner, please click on your racehorse of choice to see the initial share price. This is a one off payment to buy a share in the horse. The minimum shareholding in one of our horses is 2.5%. Ongoing training fees are paid by each shareholder, proportional to their syndicate share. Our monthly training fees are an all-inclusive monthly payment of £65 per 2.5% and £130 per 5%. Want to know more about joining a racehorse syndicate?